View of “poems,” 2018–19, Bridget Donahue, New York. Eileen Myles’s new exhibition of photographs, “poems,” which they deem is a mode of “conveying a bodily experience of being in the world,” follows the release of their new book of poems and essays, evolution (Grove, 2018). The show and the book explore and document the limits of language, both visual and literary. Below, Myles talks about whom they’re writing to, their relationship to words, and knowing when to let something go. 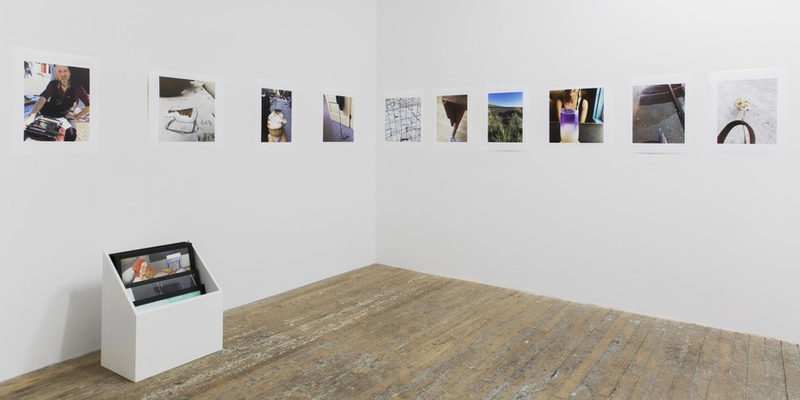 The exhibition is on view at Bridget Donahue in New York until January 13, 2019. MY SHOW AT BRIDGET DONAHUE is called “poems” with big quotes around it, because the works on view are of course not really poems but pictures from Instagram. I am a poet, and in a slightly bumpy way I feel like what I do in poems I also do in photographs, which is to say that I’m wanting them to carry the sense of moving through the world, with stuff being apprehended awkwardly and indirectly rather than straight on. I’ve always felt like I’m a visual artist in language, so I’ve basically, at least in the show, thrown the language part away, and I’m just going directly to the pictures—conveying a bodily experience of being in the world. There’s a grand male tradition of the artist being depicted in his studio. And my studio is a quite small East Village apartment, where I’ve lived since 1977. Of course, I mean, I’ve lived outside of it too, in the world. All of it, as a subject that I look at, think about, and write about all the time—it just behooves me to take pictures of my studio all the time. And literally, I’ve looked out the same window for forty-one years that, in a way both creepy and lovely, looks out over a cemetery, and so it’s all like a musical repetition for me. When I came to New York in the 1970s, I didn’t actively consider myself queer. It was a way that I had been perceived a lot, and an impression I was trying to resist. I was pushing back because I really didn’t know who I was at all, on any level. I had an aspiration to be a writer, and it wasn’t much more complicated than that. Once I wanted to be an astronaut; now I had this other mission––to become a writer. Excerpts from an interview with Eileen Myles. I called my latest book evolution because it was written during a period of a lot of picture taking––I even put one of my photos on the cover of the book, and it’s included in my show at Bridget’s. So, I have a fuzzier relationship to words. The relationship is changing. I write poems the way I write them because I want them to feel as immediate as pictures, and I always write with this idea that it’s like you’re in the same room as me, even though you’re not. It creates intimacy. I loved the college professors who acted like you knew a lot and didn’t talk to you like you were stupid, and so I try to be vernacular like that with anybody who might read my book—assuming that they’re already moving pretty fast, and that they already know how to stand in the place we’re both standing in, once they pick up the book and start from there with me. I have an essay in this book titled “Acceptance Speech,” which was written when Zoe Leonard’s “I want a president” was installed on the High Line just before the election in 2016. She invited a few artists and writers to gather there for talks, performances, and readings. Zoe said to me, “Do something about your presidency piece.” “Like what?” I asked. “You know, update it.” And I was like, “What does that mean?” Then I realized it could only mean that I am writing an acceptance speech, because I am the president. I wrote that piece, which contains lots of the frustration about the ways Hillary Clinton was derailed from becoming president and the process of the election itself. And so that speech, that moment, is sort of smack in the middle of the book. There’s a poem about Trump called “Creep.” There’s a lot of sticking pins in the politics of the moment, as well as some tracking of my own exciting and then failed love affairs. I’m never trying to “reach anybody” with a book of poetry. In a way, I’m trying to push the poems I wrote in a period of time out of my life. If you write for a few years, you accumulate words, and then you start to see patterns, and then you construct those patterns into kind of a body of work, and then it’s time for it to go. It’s a compendium of a period of experience.